In addition, the share saying the law has had a positive personal effect has ticked up over the past year. Today, about as many say its effect on them and their families has been mostly positive (28%) as say mostly negative (24%); nearly half (48%) say it has not had much personal effect. In April 2016, somewhat more said the law had impacted them negatively (31%) than positively (23%); 45% said it had not much of an effect. Much of the increase in positive views of the impact of the Affordable Care Act – and support for the law – has come among Democrats. Two-thirds (67%) of Democrats and Democratic-leaning independents now say the law has had a positive effect on the country. 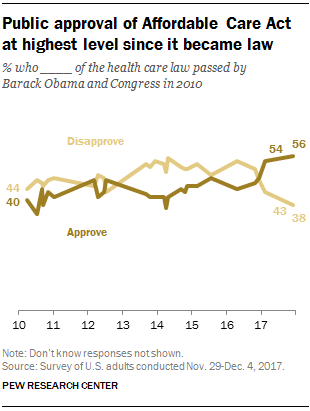 That is up only modestly from last year (62%), but in September 2013, shortly before the rollout of the law’s health insurance exchanges, only 38% of Democrats and Democratic leaners said it was having a positive effect. Opinions among Republicans and Republican leaners have shown less change. Currently 64% say the law has had negative impact on the country. Over the past four years, majorities of Republicans have consistently said the law is having a negative effect on the country. 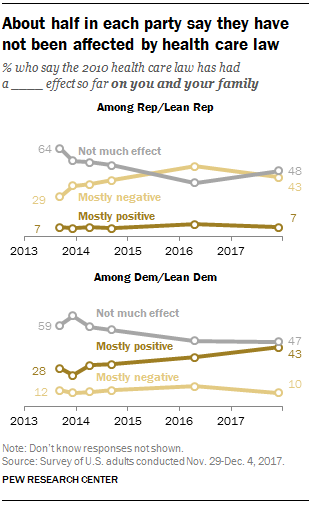 As in the past, fewer Republicans and Democrats express positive or negative opinions about how the health care law has affected them than how it has affected the country. Currently, about half in each party say it has not had much of an effect on them and their families. However, Democrats increasingly say they have been affected positively by the health care law. In the new poll, 43% say the law has had a positive effect on them and their families, up from 28% four years ago. Only 10% say it has had a negative effect, about the same share as in 2013 (12%). Among Republicans, more say the health care law has had a negative than positive effect on them and their families (43% vs. 7%). The share of Republicans saying the law has had a negative personal effect is somewhat lower than it was in April of last year (51%). Throughout the seven-year history of the health care law, opinions about it have tended to be more negative than positive – or, less frequently, divided. But in February, for the first time, a majority of the public approved of the law. That remains the case today, with 56% approving of the law. While that is little changed since February, support has jumped 12 percentage points since April 2016 (44%). 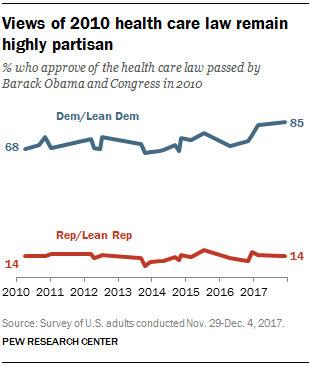 Since then, there has been a sharp rise in the share of Democrats and Democratic-leaning independents who approve of the health care law (from 71% then to 85% today). By contrast, there has been very little change in views among Republicans (13% approved of the law then, 14% today). In addition, there continue to be demographic differences in opinions about the law. By about two-to-one, women are more likely to say they approve (61%) than disapprove (31%) of the law. Men are more divided: Half approve, while 45% disapprove. Adults ages 65 and older are now more likely to approve (51%) than disapprove (41%) of the law. Still, they remain less likely than younger adults to support it: For example, about two-thirds of those younger than 30 (66%) approve. The share of young adults who approve of the law is little changed from February (65%), but as recently as October 2016, only about half of those younger than 30 (51%) approved. While Republicans and Republican leaners are widely opposed to the health care law, those without a college degree are somewhat more likely to approve of it than those with a college degree or more education (20% versus 12%). By contrast, Democrats with at least a college degree express stronger approval for the law than those without a degree (93% vs. 81%).